There is still no such thing as cats fashion show! However, there might be one very soon! This cat who took the stage by storm caused admiration in every single spectator! 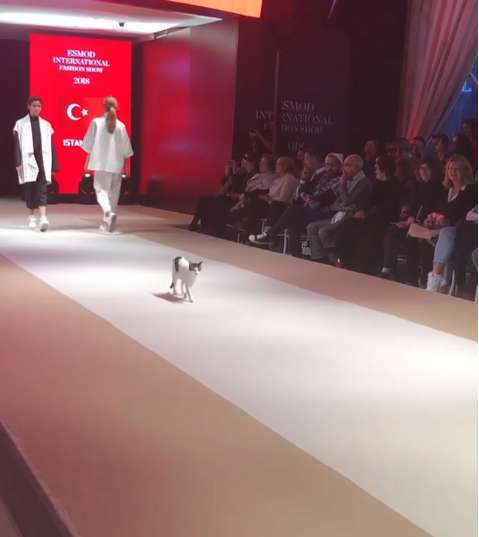 During the runaway of the Esmod International Fashion Show in Istanbul, the feline came up to the stage and totally stole the thunder. He appeared out of nowhere, and no one from the organizers saw how he walked in. “Everybody was in shock”, fashion designer Göksen Hakkı Ali revealed. 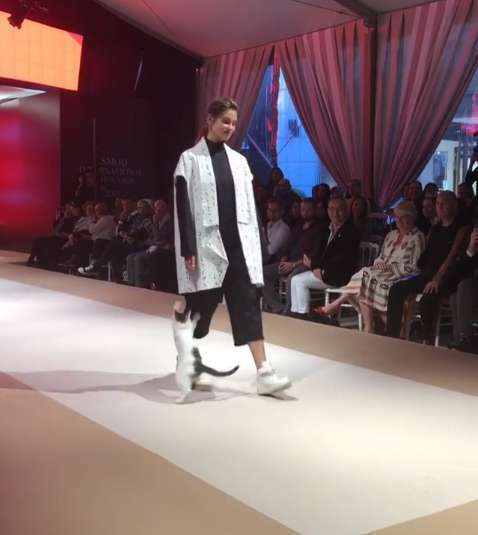 The pet sat there as nothing happened and started licking himself, paying no attention to the models who were working the runway. Then, he felt like playing with a piece of the gown on the model walking by, but failed to catch her! The cat was fantastic! The best part was when he actually began walking on a catwalk! They call it a catwalk for a reason, as these animals are so graceful in every move! He left the audience in awe! And probably, it was not the clothes they were gazing at! The video that captured an extraordinary visitor has gained many fans in no time. The Internet viewers shared how much they loved that funny feline, who felt too relaxed. It seemed that he was in his element! They say cats are independent creatures who prefer to stay aloof! However, this old stereotype fails to find proves. The experts say, cats love people, and they tend to seek their attention. In this case, the crowd enjoyed the unusual member of the runway show. The cat, in turn, tries himself as a supermodel. And he did well!